Commonly found in sinks, bathtubs and attics, silverfish are small, gray insects that feed on paper products, book bindings and glue, as well as coffee, sugar, hair, carpet and clothes. Silverfish are not poisonous to people, but they do destroy food and belongings. For our initial visit, we inspect your property to find the cause of the silverfish infestation. Next, our yard pest control technician applies the insecticidal barrier around your property’s exterior that protects you from infestation to control the silverfish population and to keep silverfish from breeding. The low toxicity insecticidal barrier used for silverfish control rids you of this household pest problem. 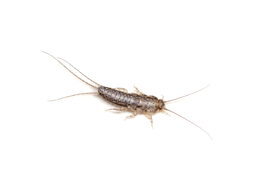 At Knockout Pest Control, we recommend quarterly pest control services packages that allow you to control the silverfish population. Our quarterly packages provide you one year of maintenance and no cost pest control service between visits each quarter. Maintenance plans from Knockout Pest Control guaranteed you year-round pest control. In the event you experience an infestation included within your maintenance plan between our scheduled visits, we revisit the property to eliminate your pest problem, free of charge for guaranteed control.